We’re in Oakland, California, and Cassius ‘Cash’ Green (Lakeith Stanfield) is living out of his uncle’s garage, with his performance artist girlfriend, Detroit (Tessa Thompson). Things are looking bad on the financial front for poor Cassius, but everything starts to change after he lands a job working as a telemarketer with a company called RegalView. Cassius doesn’t know a thing about telemarketing, but luckily, a colleague named Langston (Danny Glover) is on hand to lend some advice. Long story short, Langston tells Cassius that, in order to make killer sales and to please their bosses, he’ll have to adopt his ‘white voice’ on the phone. And whaddaya know? It works. RegalView, and is promoted to the position of ‘Power Caller’ (don’t ask). But there are sinister elements at play involving another company called ‘WorryFree’ that signs desperate Americans up to lifetime work contracts. It’s all very complicated, but let’s just say that Cassius becomes blinded by cash, gets himself all wrapped up in a bonkers conspiracy and begins to clash with his friends and colleagues, who have gone on strike for better pay. Yes, I think that pretty much covers the first half. Written and directed by American rapper, producer, screenwriter, activist, and first-time film-maker Boots Riley, Sorry to Bother You is, essentially, a scorching satire that has some fascinating things to say about America, capitalism, telemarketing, systemic racism, and much more besides. It’s well-acted (Thompson and Stanfield are fabulous, and Armie Hammer shines as a sleazy CEO). It’s funny in places. It should work, basically. Alas, it’s a bit of a mess. For a start, the film we were sold is not the one that we get. 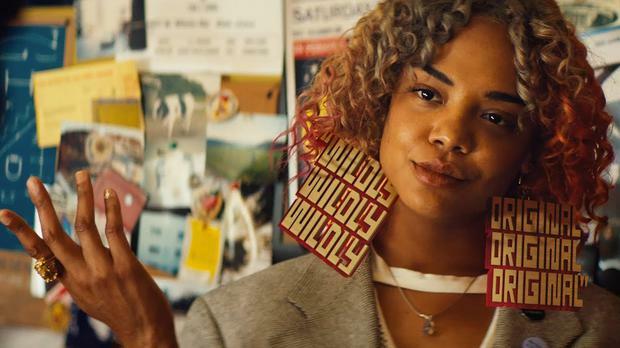 There is a wonderful idea at the centre of Riley’s debut feature — that of an African-American telemarketer adopting a ‘white voice’ to get ahead in America. But Sorry to Bother You seems to go out of its way to avoid running with it. It’s distracted by other, bigger ideas, and eventually, allows for its more surreal and abstract side to take over. The barmy second half — when Riley’s film completely loses sight of the ground and goes full-on absurdist sci-fi flick — is all over the shop, and what we’re left with is a bizarre, angry and surprisingly disorganised film that prioritises themes over storytelling. Pity.